Download Stand Up Guys in Digital HD from the iTunes store. Stand Up Guys images are © Lakeshore Entertainment. All Rights Reserved. The film Stand Up Guys being released this weekend in theaters has a nice touch. It brings together three of the most revered stars in a film emulating some of their past acting gigs. It's a testimonial to their craft that puts them in front of a camera, aged and changed from their earlier Oscar winning performances and still commanding the screen. The story brings out the best in each of the three with action, comedy and a murder or two. 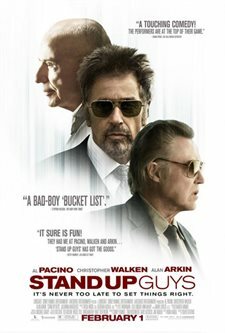 Convicted killer Val (Al Pacino) gets picked up by his friend Doc (Christopher Walken) on his release from prison after serving 28 years of his sentence. During that time he has never disclosed who was involved in bank robbery gone badly, keeping his two best friends and the mob boss from being indicted for the crimes. It's his first day out and Doc wants him to enjoy it even if Val has the feeling that someone has put a hit out to keep him permanently quiet. But, Val has a plan, one that will include Hirsch (Alan Arkin), the third man in their capper trio who has long been waiting for that special moment he can also be free. Pacino (Oscar winner Scent of Women) takes a break from hard drama and gives us Val filled with life on what he believes is his last day on earth. He has been away a long time so most everything has changed with his two best friends Doc and Hirsch. Inspired by the possibility that the three can get together for one last hurrah, it's he who instigates "the plan". Walken's (Oscar winner The Deer Hunter) role of Doc finds him plagued with memories, but still working for the mob. His life consists of making his choice of being a gangster and his morning breakfast with a young waitress at the local diner. There's not much to look forward to, but that's all going to end. As for Hirsch (Arkin, Oscar winner Little Miss Sunshine), his son has set him up at a local rest home where he's biding his time. Longing for a chance to drive a fast getaway car once more with his best buddies and with Val's plan he's about to get his chance. The film has been rated R by the MPAA for language, sexual content, violence and brief drug use. Mostly a comedy, the film has some brothel scenes that are hilarious but still for adults only.